I think I'm more or less to my goal weight. My ob/gyn told me just yesterday that he thinks I'm where I should be and would do fine to maintain my current weight. And he seems to be a stickler for weight; I get weighed for every appointment whether pregnant or not. Obviously weighing during pregnancy is a gauge for measuring potential complications, but is it really necessary to weigh a woman when the point of the visit is to do a routine test for cervical cancer? I'm not complaining, but I know a lot of people, such as those in the Health at Every Size movement, have criticized doctors who give lectures about weight when the patient went there for an ear infection, for example. My doctor is great, but he's the type who might do something like that. He recommends a twenty-pound gain during pregnancy rather than the 25-35 pound recommendation from the field of obstetrics. Anyway, point is, my ob/gyn and I are OK with my weight. But I want to stay mindful of what I eat and how much. I was catching up with my old grad school friend Greg the other day via his blog, and I ran across this post which recommended, in the strongest terms, Good Calories, Bad Calories by Gary Taubes. I read some of the reviews about it, and I ordered it from interlibrary loan. The book seems to address the science regarding the consumption of protein, fat, and carbohydrates (refined and complex). In reading the Amazon reviews and Greg's thoughts, I came to a greater understanding about food (can't wait to actually read the book). OK, so everyone knows the conventional wisdom that if you eat something sweet, you'll have some energy, but shortly after that you'll have a "crash," and so it's better to eat something with protein and complex carbs. I had always understood the "crash" to mean that you get tired and want to go to sleep. This does not happen to me. BUT, Taubes is demonstrating that eating a bowl of white rice, a doughnut, or the like will cause your blood sugar to spike (of course. I haven't been living under a rock.). So your body responds with a surge of insulin to metabolize the sugar. The insulin is still surging once the sugar has been dealt with, and then you have the "crash." Again, somewhat nebulous but still more or less common knowledge. The breakthrough for me came when I was reading about how he shows that sugar and refined carbs are addictive. You're hungry, you eat those foods, and they MAKE you hungry for more (edited to add, I guess that's why alcoholic beverages are supposedly an appetite stimulant? I don't drink, but it makes sense). THAT made me reflect a bit, and then I realized what the "crash" means for me. Sometimes when I haven't eaten for a while, I get very weak and shaky. I'm not tired, but I definitely feel like crap in those moments. I understand now that when I eat some cake, I'm much more likely to get "the weak trembles," as my dad used to call them, shortly after that than when I eat some oatmeal. Now I really get the crash/addiction cycle that is going on with the sugary foods. Another small but significant realization I made was from watching Thintervention on Bravo. One of the participants in the weight loss reality show was not losing any weight from week to week. Toward the end of the season, she confessed that she'd starve herself for most of the day and then eat a ton of food. Jackie Warner and the therapist on the show explained to her that she'd wrecked her metabolism. Of course all the sensible diet books say NEVER to skip meals, but their explanation really resonated; I'd also heard that starvation diets make the body go into starvation mode and hang onto fat/calories. But I'd always thought that someone had to go days without eating for that to happen. Apparently not...the body can think it's starving pretty quickly. So now I'm going from "five small meals with protein per day and I don't quite understand why but I'm going through the motions anyhow" to "five small meals with protein per day and I really GET how to recognize and interpret the feedback my body gives me." This isn't one of those tips I've seen on any of the GTD blogs, but it's one I intend to follow: only read/respond to work-related email on weekdays during business hours. I've been easing into it, and the regaining of mood stability has been dramatic and very healthy for me. Foods cooked this weekend: Salty Tuscan Pork Chops with Caramelized Apples and Shallots, more granola, more Black Beans with Rice, Curried Chickpeas and Tofu, Beef and Barley Soup with Escarole (we used chard, the recommended substitute, and rice instead of barley, which we couldn't find). I've never eaten healthier in my life. Again, this book is the greatest -- even if you're not pregnant. 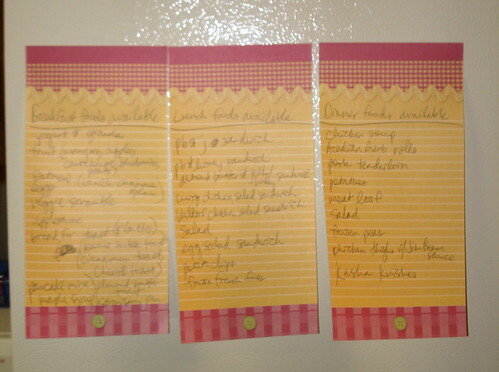 Jonathan and I think we'll keep following the diabetic diet even after the baby's born. I never thought about my blood sugar before or realized how important it is to regulate it. I have a LOT of diabetes in my family, so I want to be careful. 32 weeks, 2 days -- is how pregnant I am. I think FG has grown some extra limbs or something; I feel kicking and punching all over. 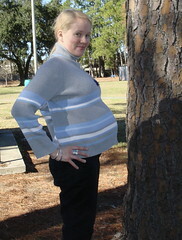 Around the early second trimester, I had been concerned about doing kick counts and about not feeling enough movement. With kick counts, you see how much time it takes for you to feel "10 kicks, flutters, swishes, or rolls." If it takes over two hours, then there might be a problem. I think I feel that number of movements every couple of minutes. Teaching prep and then sleep await; hopefully I can post again before a whole other week passes. Except the roast, everything I've cooked has come from recipes in my pregnancy cookbook, I'm Pregnant! Now What Do I Eat? The granola especially is excellent. 1. Saving money. I live in a restaurant-rich city, and residents can, if they're not careful, dine themselves into a zero bank balance, if not debt. We're putting as much money as possible toward a down payment on a house, so we do NOT need to be going out to eat all the time. There's also all the baby stuff we still have to buy. 2. Health. I love how almost all the foods in the I'm Pregnant! book are high in fiber and protein but low in sugar and white carbs; they almost assume a diabetic diet. The authors also suggest fast meals, for when you're seriously about to faint. One example is a quick taco with black beans, salsa, and cheese on a whole wheat tortilla. Another is a toasted English muffin with sliced tomatoes and melted mozzarella on top. After making the black beans, which also included jalapenos, onion, garlic, and red and green bell peppers, I realized that I could put the bean mixture, cheese, and salsa on one of the whole wheat tortillas, poach some eggs, and have myself some huevos rancheros, which Jonathan and I did. I've also been packing away winter clothes (didn't really need those, as it turned out) and hauling tote bags of books to my office. In preparation to move out of this apartment, I'm moving a lot of my books and fold-up shelves into my office. Speaking of shelves, a house, and a baby, if anyone knows of any good online sources that show ways to secure shelves to walls in case crawly babies try to climb up them, please let me know. I'm interested in getting an estimate from some contractors on some built-in (or built-on, rather) shelves, as those seem the safest. Barring that, I think wall-mounted shelves may be the way to go, the kind with the brackets. I'm also toying with the idea of getting these barrister bookshelves, which close up. and it's the beginning of the semester. As an administrator, I'm bombarding my departmental listservs with reminders and memos, and I'm planning meetings, workshops, and all kinds of stuff. I'm also toying with the idea of having all the meetings of the first-year writing committee (which I chair) be open to anyone in the department who wants to attend. Or we might just make one meeting open to try out as an experiment. I'm also thinking about organizing a group grade session, in which everyone with a stack of papers to grade gets together in a room and grades for an hour or two, without a lot of chatting and distraction. A friend of mine said that she used to organize these when she was an officer in her graduate student organization at the University of Alabama. Have any of you done these at your institution? nail polish -- actually I stopped using and buying it long ago after reading that the U.S. allows phthalates to be put into nail polish, chemicals that are banned in cosmetics in the European Union. It's probably been over three years since I spent any money on nail polish, and hopefully I won't have to buy any again. perfume -- I don't even want to admit how much of this I have. I'm sure I could wear it every day and not run out until my son turns 18. At any rate, certainly I don't have to spend any money ever again on perfume as it isn't a necessity, but I truly think I have just about a lifetime supply this very moment. makeup -- I almost never wear it, yet I have plenty, especially lip lard, as my beloved and unfortunately recently deceased cousin used to say. I have probably about five years' worth of makeup, and even if I didn't have any, I believe I'd get enough makeup in Christmas, birthday, etc. gifts to get me by, so that's another one for the list. office supplies, specifically pens, pencils, and note pads -- (not including school supplies for kids) I'm well-stocked in these items, and I believe I will never run out of them. Think about it: textbook publishers give teachers this stuff all the time, and at most conferences, the hosts give you a notebook or note pad and pen or pencil. If you go to library orientations on your campus or other events like that, you may end up with office supply swag too. After posting that, I also thought of French toast under breakfast and celery sticks under lunch. * Side note: I'll find out tomorrow when I go there next, but in St. Paul, MN, they had a Great Harvest Bread Co., and they had this terrific brown bread called Oregon Herb, with lots of onion and dill. Here, they have a bread that they describe as having "a taste of onion, dill, & rye," but they call it "Acadian Herb." I want some of that in roll form to have with soup, YUM. **not as much as I had hoped to accomplish, but there are a couple more weeks until classes start, I suppose. Mystery Diagnosis marathon -- a former student of mine from East Carolina U, when she was in my class, raved about that show. I hadn't seen it before, but I got sucked in and spent the better part of a day watching it. I love how formulaic all the stories are, and my favorite part is when the family meets the one doctor who finally gets the diagnosis right. Jon & Kate + 8 marathon -- why yes, I am a fan of the Gosselins. And the Duggars, if you must know. The Wire (seasons 1 and 2 on DVD) -- Jonathan has been trying to get me to watch this. It's pretty good. The Unit (season 1 on DVD) -- another Jonathan pick, which I also like even though the women on the show are pretty uninteresting so far. What is your opinion of regular V8?